My initial exposure to miniatures was in the 1980’s—I saw a miniature farmhouse used as a prop in the window of a resort gift shop. I went inside to take a look and found it was made from a kit, and I purchased it. A couple of months later I saw an article in the Philadelphia newspaper about a miniature show being held that weekend, not far from our home. I was fascinated with what I saw and began a journey in the world of scale miniatures with the wonderful people involved in the endeavor. 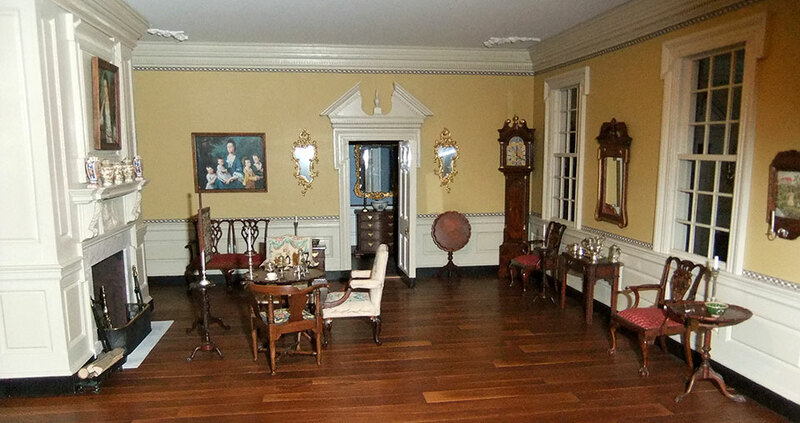 An interest in architecture, early-American history, and antiques led me to early-American rooms. A friend who was an antiques collector had salvaged the interior of a Pennsylvania Great Hall from an historic house about to be demolished. With almost unlimited access to measure and photograph, I made my first 1” scale historic room in 1995. I became an IGMA Artisan, then a Fellow member, receiving my Artisan and Fellow status in interior structures. I have made thirty 18th and early-19th century miniature rooms, as well as architectural elements of those eras—door entrances, facades, and chimneypieces. These pieces are all in our home and we now have no room for additional rooms. At the same time I have a lot more free time as I reduce the time I spend in my business. This is a dilemma. Last fall a friend asked me to make her two pair of bookends, consisting of miniature vignettes. I know from my experience teaching room interiors at the Guild School that people do not have space for large rooms. So I have decided to make these pieces and sell them at the IGMA Show and Philadelphia Miniaturia, beginning this year. The pieces are intended to serve as bookends, but can also be displayed as free-standing pieces. I refer to them as vignettes. They are based on the historic rooms I have made, and I hope you will find them to be a showcase for your favorite miniature furnishings and decorative items. The photos on my website are of some of the rooms I have made, which are not for sale, as well as the initial pieces I will sell at the shows. Though I plan to only sell at the Guild and Philadelphia Shows, feel free to inquire about anything that may interest you.